Experts in Germany and the EU are ascertaining the environmental ranking of different transport modes. An article from Aloft - An Inflight Review. By train? By car? By bus? Or even by plane? The most environmentally friendly means of getting from A to B depends on several factors: how modern the means of transport are, how much time is available, the quality of the infrastructure and the location of points A and B. The number of voyagers also plays a role. The more people travelling together and the longer the journey, the better the ecological footprint per capita. However, the overall ecological burden continues to increase as a result of the rapid growth of global air traffic. The situation is paradoxical: the air traffic boom makes the individual journeys more environmentally friendly. 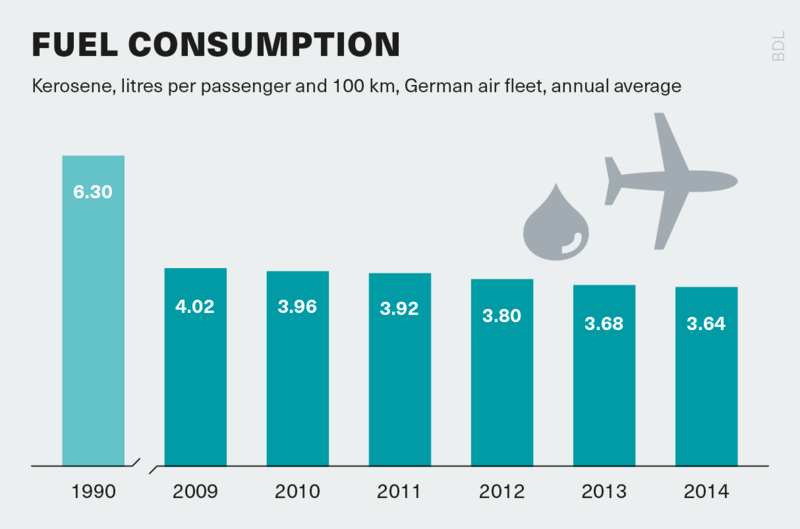 Not only technical improvements, but better operational efficiency, as well as longer and more fuel-efficient flight distances, have resulted in the continuous decline of the German air fleet fuel consumption. According to an “Energy Efficiency Report” published by the German Aviation Association (BDL) in 2015, the fuel consumption of the German air fleet was 6.3 litres per 100 passenger-kilometres in 1990. In 2014, the number sank to 3.6 litres (cf. bottom left chart). For short distances (up to 800 km), the fuel consumption ranges from 4.2 to 6.8 litres, on medium distances (800 to 3,000 km) from 2.6 to 4.2 litres and on long distances (over 3,000 km) from 2.9 to 3.5 litres. On average, charter flights consume less kerosene per person because they tend to be planned and booked long in advance and usually operate at a higher passenger load factor than scheduled flights. Based on information provided by members of the BDL, the average value of 3.6 litres for Germany corresponds approximately to the 4.9 litres of petrol equivalent ascertained for 2014 by the “Tremod” (Transport Emission Control) computer model. Tremod is used by federal ministries, automobile manufacturers, the Deutsche Bahn railway company and the Federal Environmental Agency. At 6.1 litres, the fuel consumption for car passengers well exceeds that of air passengers, because the average car only carries 1.5 passengers, whereas 71 per cent of airplane seats are occupied. The air transport figures for emissions of greenhouse gases show a different picture. If they are converted into carbon dioxide equivalents in order to make them comparable, an average of 21.1 kg are attributable to a person who flies 100 km. Those who travel by car, emit 14.2 kg; and coaches, with only 3.2 kg, are still ahead in this respect. Railway transport figures are worse, with 4.1 kg in long-distance transport and 6.7 kg in local public transport. In the transmission process from the power station to the train, operating power is lost, and the power stations themselves also emit large quantities of pollutants. 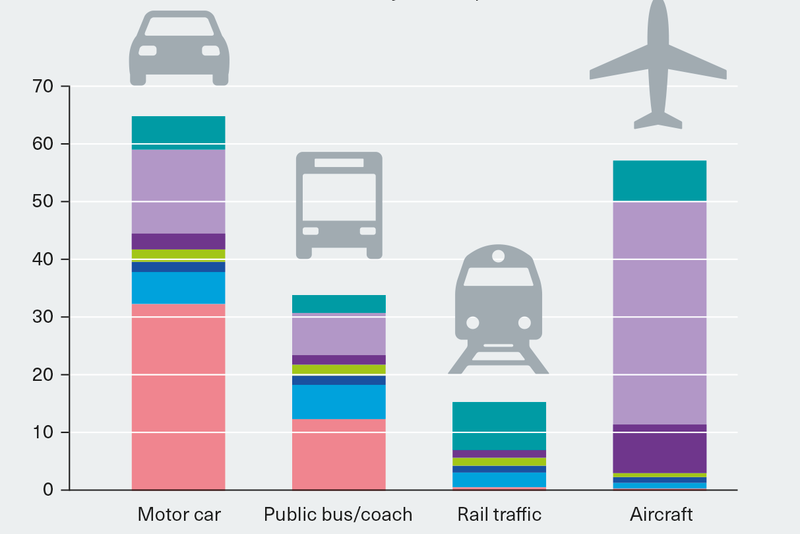 With regard to many other emissions, however, rail traffic has better values than road and air traffic (cf. table above). Contrails and cirrus cloud formation at high altitudes as a result of air transport may have a significantly higher impact on the environment than presently assumed. However, so far no data is available. 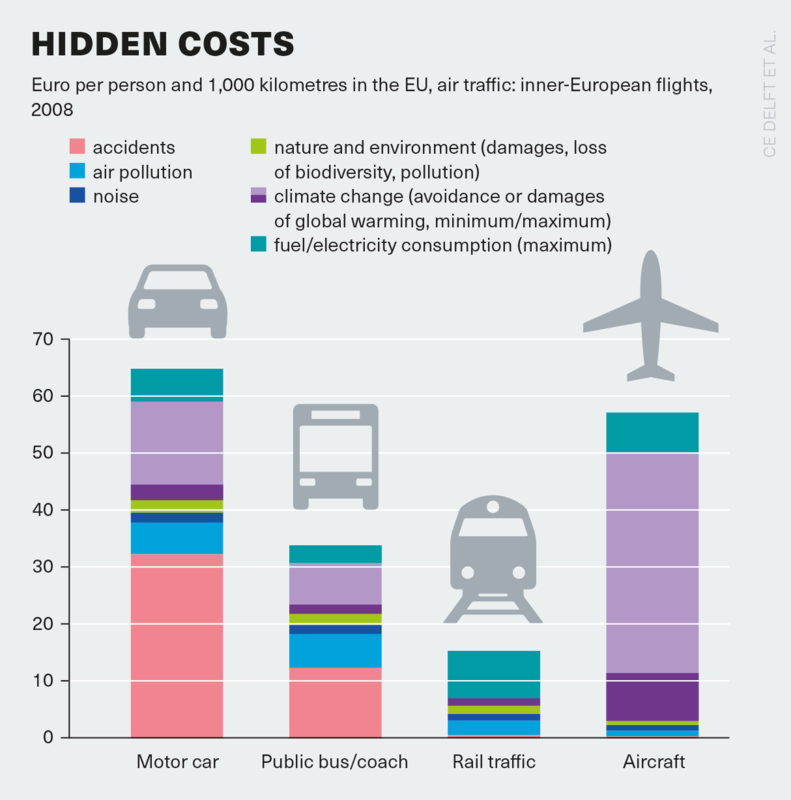 Since 1999, the EU has attempted to calculate the exact costs of transport – those that arise in society or nature and are not financed by traffic participants. These “externalised” costs ensue from congestion and accidents, air and noise pollution, soil and water pollution and from climate change and soil sealing. Calculations are made on what can be expressed in monetary terms, based on questions such as what it would cost to eliminate or avoid this damage? How strong is an economy burdened by inaction, illness and premature death, by crop failure and the reduction of biodiversity? Calculations for 2014 were very accurate. EU experts estimated that the externalised costs of aircraft noise produced by a plane landing and starting in Luxembourg, amounted to 285 euros. In Warsaw it was only 27 euros. However, major uncertainties remain with regard to the impact climate change will have. Valid calculations regarding what proportion of flooding or storm damage can be attributed to global warming are hard to perform. In a comparison of transport modes compiled by the EU for 2008 (cf. chart below), these uncertainties are particularly pronounced in air traffic because it emits the most greenhouse gases. However, it is already possible to conclude that assuming maximum harmfulness of emissions, air and road traffic are approximately on a par when it comes to externalised costs. Air travel versus … this blog proved really useful for my friend but surely for me too. He is going to have a flight next week for enjoying his world tour and surely will share with him this article.